This Thanksgiving, you’ll gather with your friends and family to laugh, reflect, and stuff yourself silly. And for 65 percent of American households, that family includes a member with fur, feathers, or scales. Go ahead and let Fido or Fluffy join in the celebrations (and indulge in some table scraps) on Thursday, but be sure to follow the below safety guidelines outlined by the American Veterinary Medical Association (AVMA) and ASPCA. DO: FEED YOUR PET TURKEY. 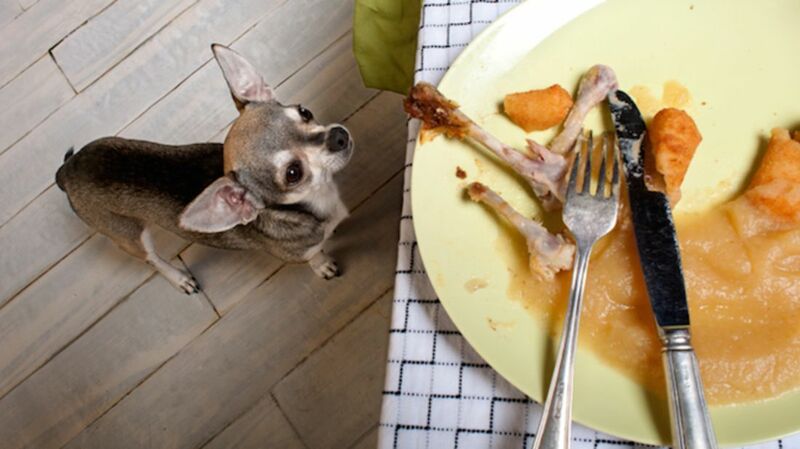 Unless your dog or cat has an allergy, turkey is perfectly safe—with a few caveats. Keep the pieces small, make sure they are fully cooked, and be sure to remove all bones. DON’T: SHARE YOUR BREAD DOUGH. The yeast found in raw bread dough can cause painful gas and bloating in your pets that can quickly turn into a medical emergency. DO: PREPARE A FEAST OF THEIR OWN. To keep your dog occupied when the humans sit down to dinner, give him or her a delicious canine-safe treat. Before dinnertime, mix bits of turkey, sweet potato, and pumpkin puree in with your dog’s regular kibble, stuff it into a Kong, and stick it in the freezer. The frozen meal will keep Spot busy for much longer than his usual dinner would. DON’T: LET THEM EAT CAKE. Chocolate is a big no-no for dogs, as is an artificial sweetener called xylitol that is often found in sugar-free baked goods. Remember: A tired and distracted dog is a happy dog. The excitement of guests arriving can be overwhelming for some pets. To keep your dog calm, make sure you take him to the park, dog run, or on a long walk in the morning to tucker him out. If all the excitement becomes too much, give your dog some “me time” with plenty of his favorite toys in another room or his crate. DON’T: LEAVE THE TRASH OUT. A full house makes for distracted hosts. To make sure your four-legged friend doesn’t stick his or her nose where it doesn’t belong while you’re looking the other way, make sure your trash is covered and properly stored out of reach. Keep a close eye on your pet to make sure she doesn’t make a dash for the door in the midst of the chaos. (And you should always have the proper identification tags for your pet and get her microchipped just in case she gets out.) Immediate action can also make all the difference if your pet swallows a dangerous food, plant (here’s what’s hazardous for dogs and cats), or foreign substance.